Even though temperatures were only in the single digits here yesterday, I thought that a quick outdoor photo shoot was in order. I’ll look back later and think how pretty it looks, and I’ll probably forget how cold we were! 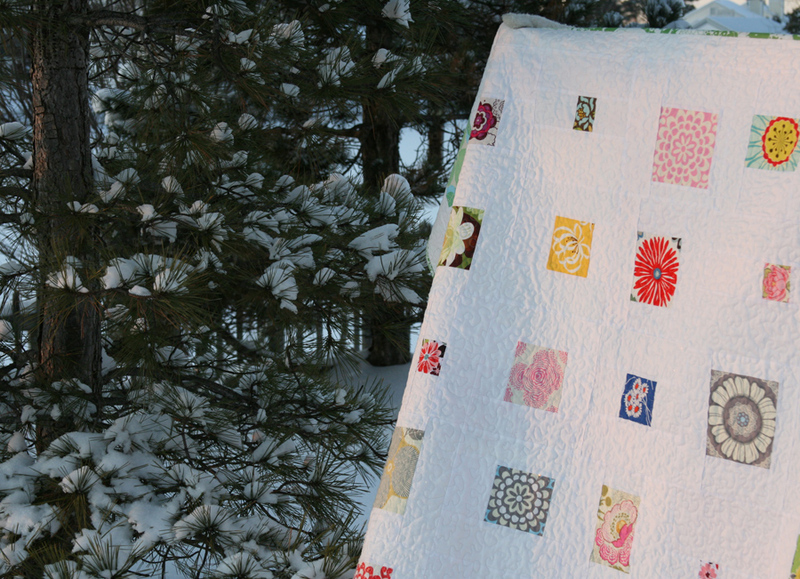 The hardest part of making this quilt may have been finding enough floral fabrics. I didn’t want to have to go out to buy fabrics for this quilt, so I spent quite some time going through my entire stash as well as all my scraps. I aimed for a mix of sizes, trying to include even a few teeny tiny flowers. The binding might be my favorite part. I’m seriously in love, and in fact it changed this quilt from one I liked to one I really love. 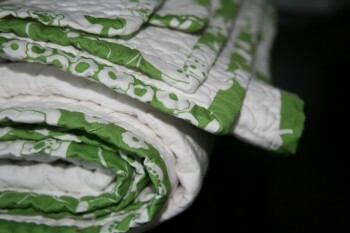 I wanted a floral, but something not too busy, so I was happy when I came across this Alexander Henry Ava fabric in green. 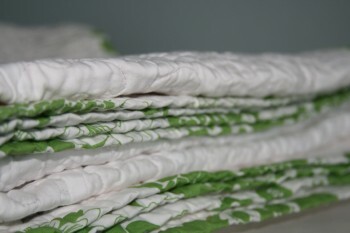 If you’ve seen it, you know that it is a floral print, but when used as a binding, it has a nice mix of green and white and it’s not noticeably floral, unless you look closely. Did I mention that I love it? It’s been added to the rotation, and I think it will be a favorite. This entry was posted in [search] Other Quilts, 2009 Finished Quilts, Finished Quilts, Household Sewing - bags, napkins, pillows, Posts about Quilts, Quilts and tagged alexander henry, Ava, designer, Fabric, flowers, free motion, handmade, modern, quilt, quilting, stippling, white. Bookmark the permalink. 29 Responses to A field of flowers. Love the flower quilt! Outside photos are the best. 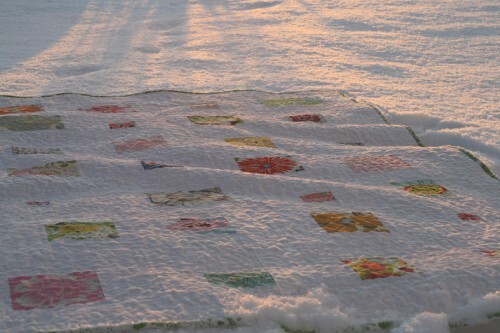 I love that you brought your quilt out in the snow. I wish I shared your love of binding. Just lovely! I love the back. It is wonderful. It’s going to be close to 80 degrees here today (something we rarely see in summer). *sigh* I’ll trade you the snow for a couple of days. That came out really nice. I agree about the fabric choice for the binding – a perfect compliment to the overall style. Beautiful quilt! The pics in the snow are lovely. This quilt is the best thing since sliced bread!! I just think it is the cleverest use of fabrics. 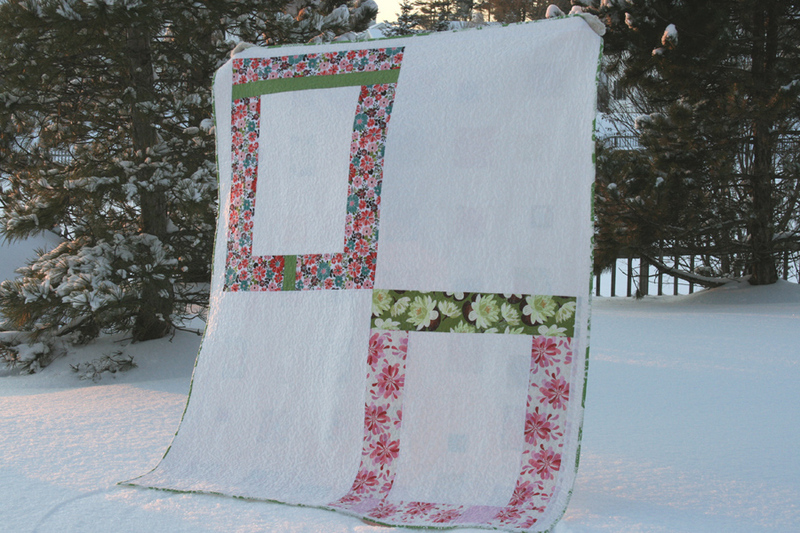 I sure am liking the trend in blogland for these quilts with all the white. They look so clean and they allow the focus to be on the great fabrics everyone has. It turned out great and I agree on the binding – it completely makes the quilt. 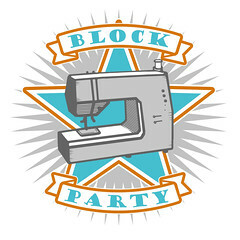 Have you checked out the Sew Mama Sew blog today? There’s a great ‘atta girl’ for you and your success in sewing over the last year 🙂 Congrats! Oh it came out so well! You’re right about that binding – it’s perfect!! And brrrrr… the quilt looks cold! oy, what a pretty field of flowers. good choice of binding, indeed. makes me want to make a white quilt, too. i know the snow is melting under that warm, snuggly quilt. love the flowers in the snow. That is absolutely beautiful. I must learn how to make a quilt! Your quilt came out so nice! And I love all the snow in your photos. it’s gorgeous!!!! I do love the binding, too! I have been reading your blog for a little while but I just wanted to let you know that I really like your new quilt. I have just started working a quilt (my first). It’s always fun to see what you come up with. I love this quilt! And being from GA where we haven’t even needed a COAT until today, I can’t imagine a day in single digits. Here’s to wrapping up in the cold with a glimpse of Spring flowers. I love it. I can’t believe how fast you can turn these around! I am still working on my 10 inch squares inspired by another quilt of yours. Love the fussy cute flowers framed in white. 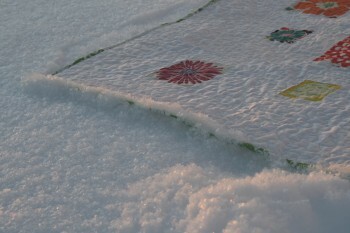 Of course, the quilt looks so pretty lying in the snow for your photo shoot. Stay warm! Gorgeous!!! Front to back and all around! And I love the binding! i found your blog today through flickr and i am so glad i did. there is so much inspiration here. i will be back often to see waht you are up to! this flower quilt is so beautiful. i love it. Oh, i also wante dto ask you if you live in vermont? i went to school there and love it. i don’t get back there enough. 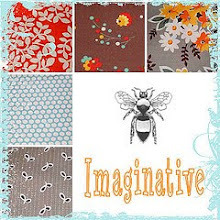 can i ask what type of white cotton fabric you use…i have been on the search for that perfect white cotton fabric to quilt with.